Wells in Somerset is a beautiful medieval city. It is packed with things to do and see. Wells is only a couple of miles away from my bed and breakfast and it has long held a special place in my heart. 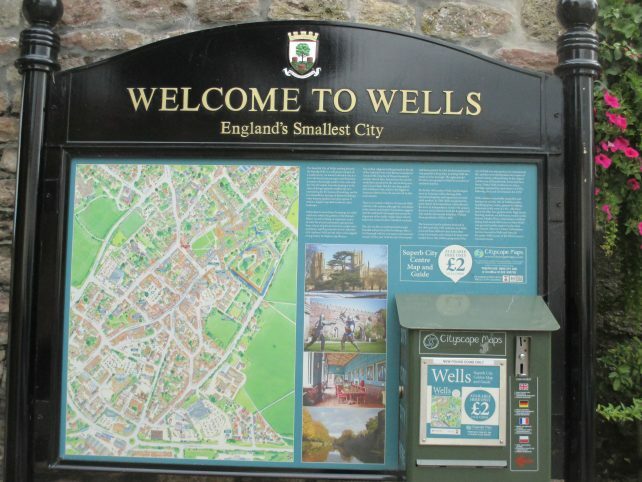 I was fortunate enough to spend over a decade working in Wells, so it is a city I know well. Its size makes it easy to navigate, (it lays claim to being England’s smallest city) so you can experience all the city’s delights by foot. Wells is a place that offers so much. Historic buildings and incredible architecture, a wide range of independent shops, bars and cafes and an award-winning market (held on Wednesdays and Saturdays). 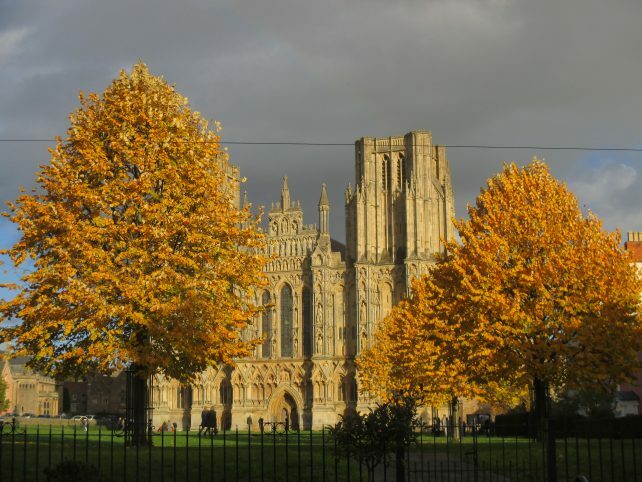 You can watch swans ring a bell to be fed on the moat of the Bishop’s Palace, marvel at the incredible West Front of Wells Cathedral and stroll down Vicars’ Close – one of the oldest, inhabited streets in Europe! And these are all within a 5 minute stroll of one another. There’s also a museum, lovely park with adventure play area, an incredible concert hall and regular festivals which celebrate food, comedy, art and literature. On a sunny afternoon you can sit on the Cathedral Green (or if you are a little more ‘mature’, one of the numerous benches) and watch the cathedral take on a golden hue as the sunlight hits it. As the name suggests, this is the home of the Bishop of Bath and Wells. Within the 14 acres of gardens (which have been recognised by the R.H.S) you’ll find the springs which gave the city its name. (Apparently, the Romans settled here.) 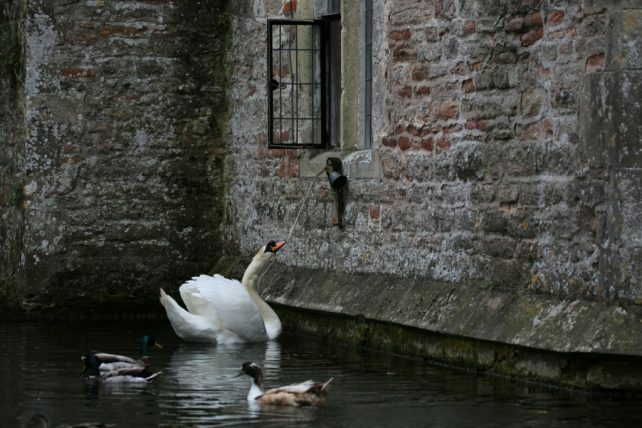 Stroll back over the drawbridge and you might be lucky enough to see the resident swans ring a bell for food. 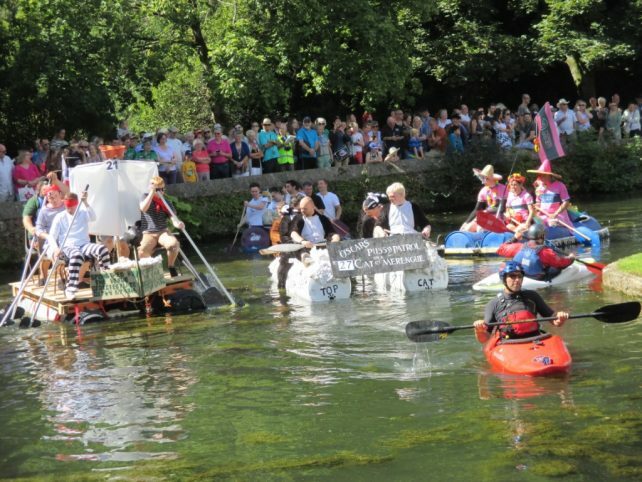 During the August Bank Holiday the calm waters of the moat are temporarily churned up as teams paddle furiously to battle for honours in the Moat Boat Races. Even the Bishop takes part! This is one of the oldest, continually inhabited streets in Europe. 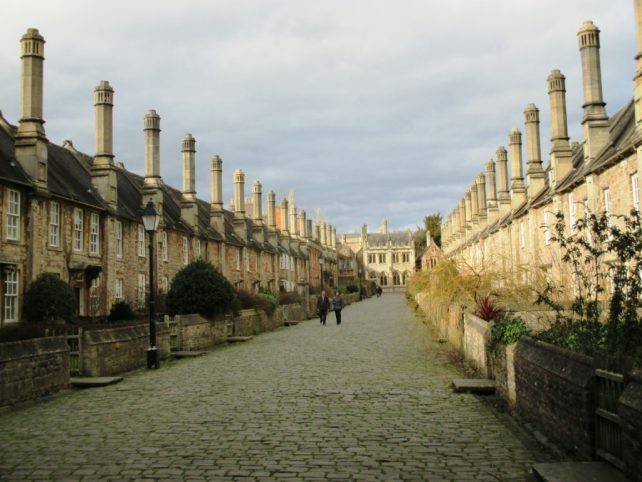 The close has a beautiful symmetry to it and many of the houses are occupied by members of the cathedral choir. You will find it just off the Cathedral Green. The Market Place, just off the Cathedral Green (in the opposite direction to Vicars’ Close) is the venue for a twice weekly market. 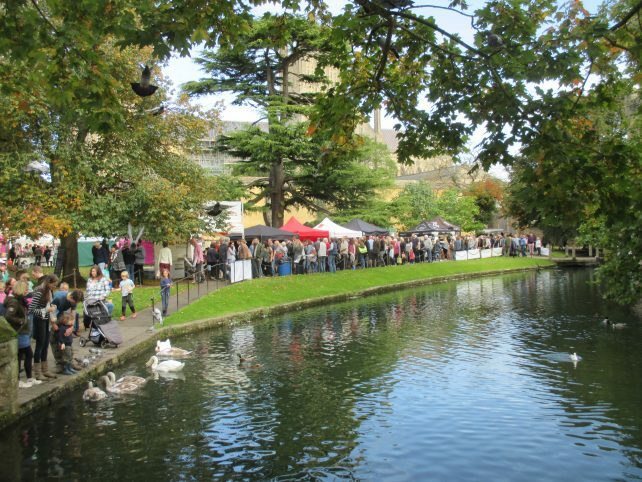 Alongside independent stalls selling an array of handmade goods is an award-winning Farmers’ Market. This is a ‘foodies’ delight. Fresh fish, pies, fruit, veg and ethnic food from different nations. In total, there are usually over 50 different stalls selling their wares on market day. Support one of the many independent retailers in the high street. These include a great hardware store (where you can still buy individual nails and screws), shoe shops, a butcher, cafes and coffee shops. Visit Wells in May and you could be laughing. It’s the month in which the Wells Comedy Festival takes place. In October, the city hosts other festivals which encompass food, literature and art. 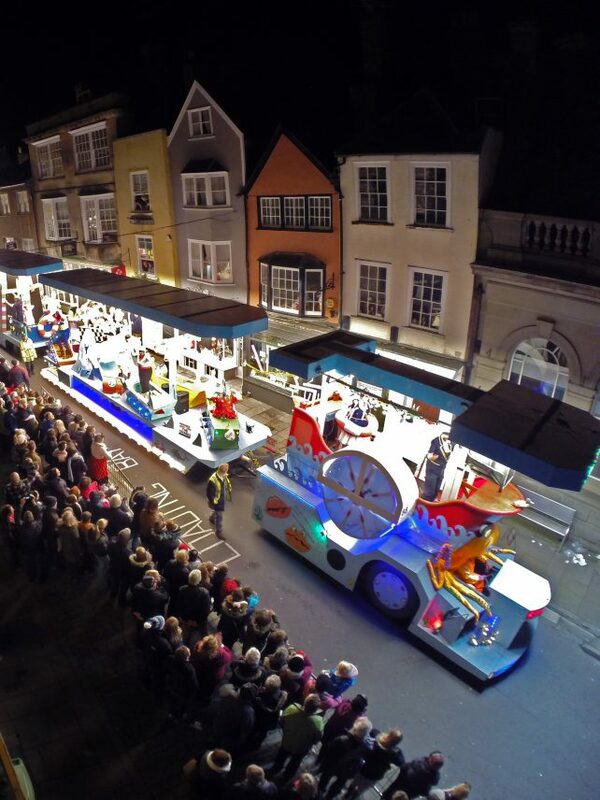 And if that wasn’t enough, Wells is also one of the routes for the Somerset Carnivals in November. Anyway, do come and experience Wells, Somerset. It maybe small, but it’s perfectly formed.